Michael Keaton was born the youngest of seven children in Pittsburgh, Pennsylvania. A young child with a vivid imagination, Michael seemed to enjoy playing make believe more than just living the average life of an East Coast kid. He dropped out of Kent State after his sophomore year in 1972 to pursue other avenues, first taking a job as a stagehand at a local PBS station and eventually starting his career as a crew person on the set of Mister Rogers Neighborhood, and he even played the part of Black-and-White Panda. Michael had to change his last name to Keaton, because there was already a Michael Douglas in the Screen Actors Guild. He had a limited career in television, from his 15 seconds of fame as a bank robber on Mary Hartman, Mary Hartman to being part of an ensemble cast of great actors such as Mary Tyler Moore and Swoozie Kurtz on Mary's self titled variety show. In the late seventies Michael and Jim Belushi starred on Working Stiffs; a show that was directed by Penny Marshall, received great reviews and had all the makings of a hit, except for the fact that it had no viewers and was cancelled after six episodes. In 1982, Michael almost lost the first big movie role he ever had, due to the fact that he was too manic, in the movie Night Shift, co-starring Henry Winkler and Shelley Long. The following year, Michael went on to playing a starring role in the hit comedy, Mr. Mom . After turning down the role Tom Hanks made famous in Splash , Michael went on to star as a funny gangster in Johnny Dangerously, a car maker in Gung Ho, a hockey player in Touch and Go and a con artist in The Squeeze . None were box office successes and could have ended a career that was just beginning, but in 1988, Michael made a movie titled Beetlejuice , which was a hit and got his career back on track. He then followed with a dramatic turn as an addict in Clean and Sober. Michael's acting ability in both films won him the Best Actor award from the National Society of Film Critics. Then it was back to the funny farm for The Dream Team, in which Michael played an escaped mental patient with a history of violence, who also claimed to have built the World Trade Center and raced in the Indy. When Michael was cast as the caped crusader in Tim Burton's remake of Batman in 1989, no one thought he could play the part seriously, but critics were proven wrong when the film became the number one film of the year. Now a certified star, he tried a different turn playing a psychotic madman in Pacific Heights (1990) before going on to make One Good Cop (1991), Batman Returns (1992), Much Ado About Nothing, My Life (both 1993) and The Paper (1994). Michael's next film was not until Christmas 1995, when he starred with Geena Davis in Speechless, in which the two portrayed speech writers for competing political parties. Another comedic turn came in Multiplicity (1996), where he played an overworked man who clones himself, and whose clones clone themselves until there are four "Dougs" walking around, some not as bright as the others. In 1997, he appeared in the Quentin Tarantino film Jackie Brown , co-starring Samuel L. Jackson, Robert Deniro and Bridget Fonda. The film was a critical and box office success and made Michael's character so memorable that he then made a cameo in the Steve Soderbergh film, Out Of Sight (1998), which, like Jackie Brown, was based on an Elmore Leonard novel. Next came Desperate Measures , a very controversial movie, in which Michael portrayed a convicted serial killer who is needed to save a child's life. It was released to audiences after numerous rewrites, but did not fair well with critics or moviegoers. Michael then turned to something more family friendly with Jack Frost (1998). Co-starring Kelly Preston, he played a man killed in a car accident who is then reincarnated into his child's snowman. Next, he played opposite Robert Duvall in Road to Glory. After a slight career lull, he returned to the big screen playing the father in a number of movies, including Mandy Moore's in First Daughter (2004), Lindsay Lohan's in Herbie: Fully Loaded (2005) and Alexis Bledel's in Post Grad (2009). He also starred in the thriller White Noise (2004) and in the comedy The Other Guys (2010) alongside Will Ferrell and Mark Wahlberg. More recently, he starred in the 2014 motion picture Need for Speed , based on the popular video game of the same name. However, it was his role in Birdman or (The Unexpected Virtue of Ignorance) (2014) that earned him his second Golden Globe nomination and first win. In a touching acceptance speech, he thanked his son and best friend, Sean Douglas, from his seven-year marriage to actress Caroline McWilliams. Just days later, he was nominated for an Academy Award for Best Actor for his work in the film. In 2015, he lent his voice to the animated film Minions and starred in the Best Picture-winning drama Spotlight (2015). 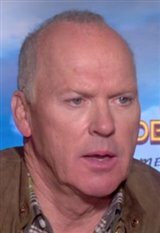 More recently, he starred in the biographical drama about McDonald's founder Ray Kroc in The Founder (2017). He can also be seen in Spider-Man: Homecoming (2017) and American Assassin (2017).